ASPIRE55 Gold Members can bring unlimited guests to the event. Each ticket is valued at S$10. In the event your schedule changes, kindly cancel so that other people can have your seat. ASPIRE55 Partners and Staff can bring unlimited guests to the event. Each ticket is valued at S$10. In the event your schedule changes, kindly cancel so that other people can have your seat. ASPIRE55 Silver Members can bring 4 guests to the event. Each ticket is valued at S$10. In the event your schedule changes, kindly cancel so that other people can have your seat. 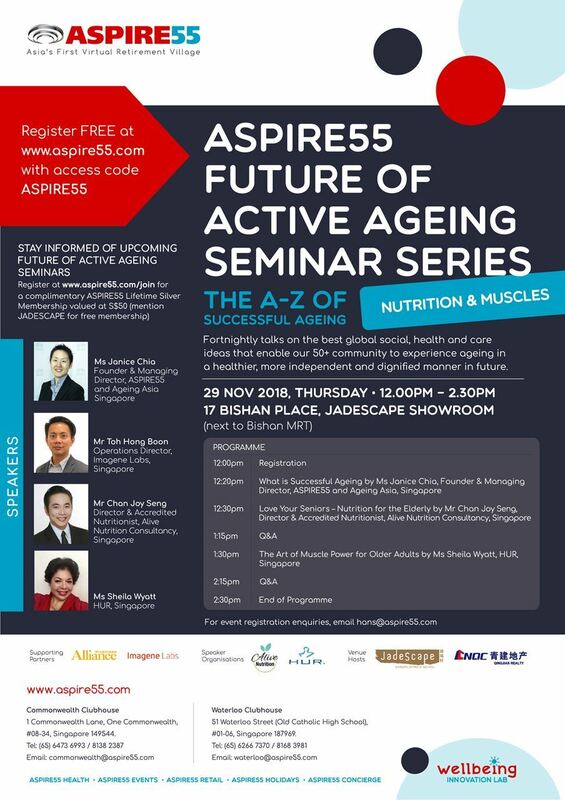 ASPIRE55 - Asia's First Virtual Retirement Village brings you our regular Future of Active Ageing Seminar Series that covers the A-Z of successful ageing. Our regular talks focus on the best global social, health and care ideas that enable our 50+ community to experience ageing-in a healthier, more independent and dignified manner in future. Ageing is a natural process that everyone will experience. Appetite for food and sense of taste may decrease, and chewing and swallowing of food can also become difficult. Together with the decrease in metabolism and function of digestive system, it is important to learn how to live and eat well during old age. This talk covers on the main areas of nutrition concerns that affect the elderly. *To receive notifications of future programmes, do join ASPIRE55 as a Lifetime Silver Member (Valued at S$50) Free Memberships are available at each event. Remember to ask for a registration form.